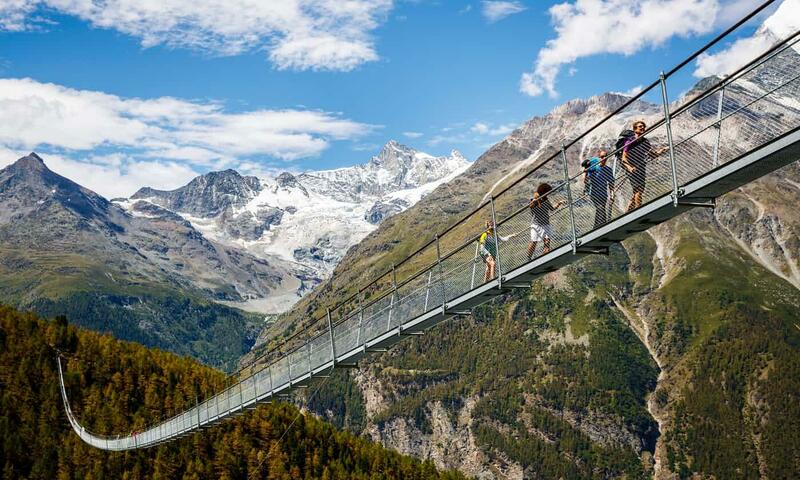 Switzerland has opened the world's longest suspension footbridge. It is 494 meters long. The bridge is suspended between 1,600 meters and 2,200 meters above sea level. It is only 65 centimeters wide and goes as high as 85 meters above the ground. The bridge crosses the deepest-cut valley in Switzerland. Hikers can look down onto it through grates in the bridge. Without the bridge, the journey previously took up to four hours. According to Swiss reports, it took only 10 weeks to build the bridge. And the structure surpasses Germany's "Titan-RT" as the world's longest suspension footbridge. The "Titan-RT", which opened last month, is just over 450 meters long. It crosses Germany's highest reservoir, the Rappbode Dam. The Swiss bridge is also longer than the so-called "footbridge in the sky." This bridge, built in 2014, is part of the Sochi Sky Park in Russia. It spans 439 meters and includes observation platforms looking on the mountains and the Black Sea Coast. The melting ice caused a rise in sea level. Radar altimeters are used in aircraft to indicate height above the ground of sea. Employers look favourably on applicants who have work experience. On top of the tower is an observation platform that some councillors say is obtrusive. 1.Hikers can look down onto it through grates in the bridge. I wish you wouldn't look down on this kind of work. When you are afraid, you may look down shyly. 2.Without the bridge, the journey previously took up to four hours. He took up with smugglers. The entire memo took up all of two pages.